This compact keylock carabiner offers a versatile range of functions, all while reducing snags and being easy to clip and clean. APPLICATION : rock climbing, ice climbing, rappelling, caving, rescuing, engineering protection, high-altitude operations, adventure, exploring etc. High-strength stainless steel alloy. Major axis strength is 25KN≈5600 pounds. 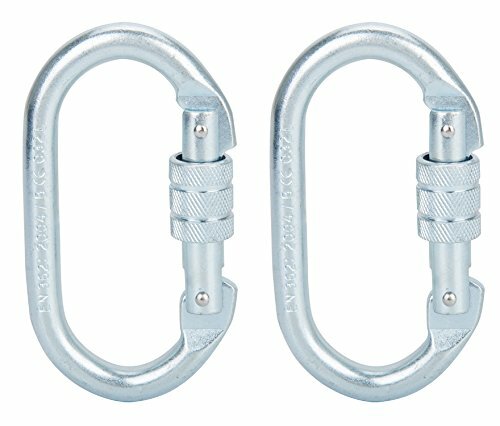 2 Pack Lock carabiner hooks. Locking gate reduces chance of open-gate failure. Screw lock and spring clip lock make them safety and convenient. SIZE: Length:11cm/4.33in, Width:6cm/2.4in, Lock Diameter:1cm/0.4in. Professional carabiner for rock and ice climbing, rappelling, working aloft, fishing, hiking, traveling, as a keychain, hanging a hammock, and yoga.